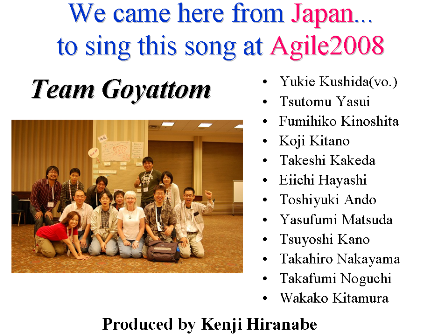 I got 2008 Gordon Pask Award at Agile2008 and sang "Dear XP"
The biggest event for me was the banquet party. I got 2008 Gordon Pask Award for contribution to Agile community. And I led a group of Japanese to sing the song Dear XP! Kanban is another emerging topic, I'm catching up with. I met David, Corey, Aaron, and Karl -- "Kanban All Stars" at the conference! 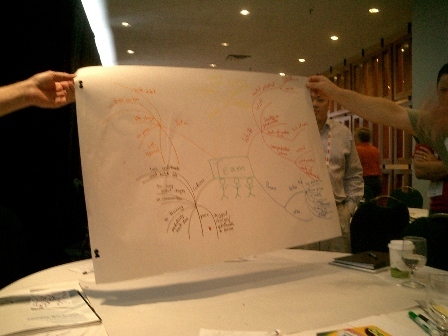 This is a photo from workshop led by Karl and Aaron. 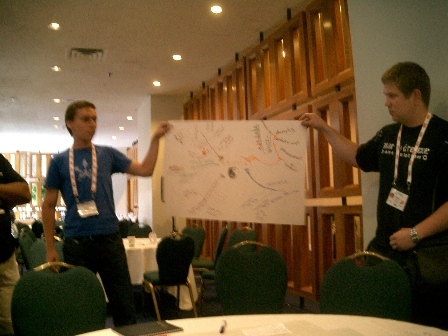 Corey summirized all the Kanban related sessions in his blog. Kanban works very well in relatively a stable development, like maintainance phase of products, where team structure or state transition of work items is identified and stable. Here is my observation of Kanban 9 features. Kanban is a balancing tool between continuous flow and reducing WIP. AND, is a visualization tool for Kaizen or process improvement. My infoQ article related to this topic is here. 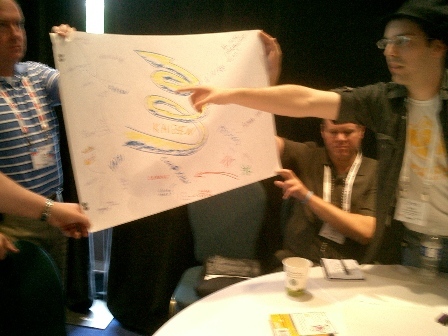 Agile UX(User Experience) was the most emergeing and creative edge at Agile2008. Alan Cooper's keynote was about UX, recongizing Agile as the first development approach that makes UX design work. 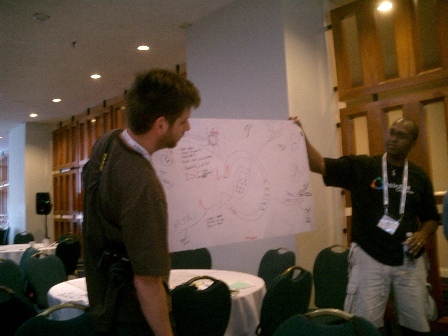 And here are some photos which UX stage people including Peter Roessler, salesforce were doing -- Graffiti Wall. I'm familiar to these walls but, this is awesome. Colored sticky notes are prepared in a box with a colored instruction tents. 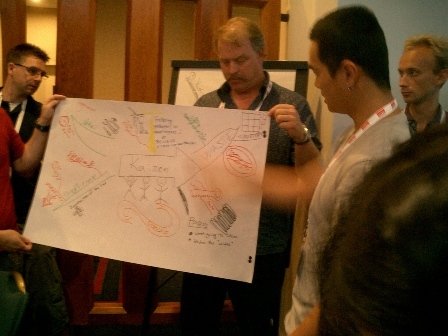 I led session at Agile2008, "Learning Kaizen from Toyota". Conflicts during organizational transition occuring in factories which adopt TPS has a lot in common with ones which adopt Agile. In this session, I showed them a video of factory reconstruction, and discussed the commonalities we found. 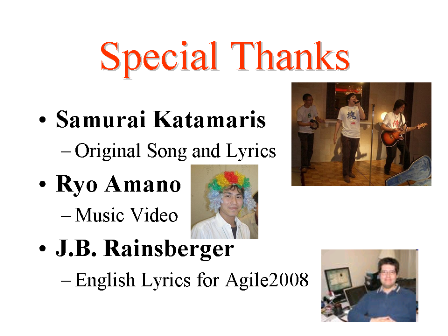 We're going to sing the "Dear XP" song at the banquet party of Agile2008. This song is originally written by Samurai Katamaris and published as the official theme song of XP-festa 2006 in Japan. This time, J.B.Rainsberger wrote a new English lyrics for us ! Ryo Amano made this video and superimposed the new lyrics. Kent Beck gave us a supporting message via email, thank you! Music has a way of expressing sentiment and feeling that don't come through any other medium. I wish I was going to be there. I have a baritone ukulele that I think would fit very nicely into the sound. Please say hello to all my Japanese friends there for me. developmet, and it is podcasted! The title is "Making Tangible The Intangible." Kent Beck and a lot of my hero's before. I talked about Lean principles and TPS first and the effect of using it in software development. BestBrains Visited Change Vision, Inc.
"BestBrains", in Denmark, visited Change Vision attended by Denmark Ambasador Yamaguchi-san. BestBrains are Agile and Lean consultants and practitioners, implementing the concepts into the real world software development. They came to Japan to see Japanese Lean companies including Toyota, Honda, Fujitsu, and NEC who have their own implementatoin of TPS. 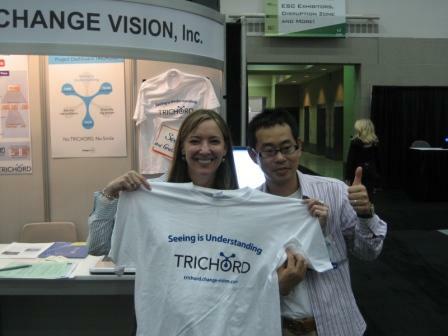 That day they visited Change Vision to see our practices of Agile software development and also to see "TRICHORD". (TRICHORD is a project "Mieruka"(visual management) tool that makes Agile teams more productive, collaborative, and fun). Before that day, a Japanese agile community "XPJUG" had a night gathering "Agile Night With Danish Agilists" with BestBrains to share Agile and Lean thinking and the current situations in Japan and Denmark. I attended their visit to Toyota, Fujitus, and the "Agile Night", and found that they were keen to learn not from books, but from the Gemba(real workplace). We got very excited after the Toyota plant tour, and enjoyed Kaiseki-dinner in Ginza. I went home early that night, but heard that some went to another bar, and others woke up early the next morning and visited Tsukiji. How wild Danish people are ! I myself enjoyed talking with them during the trip very much. I'm beginning to think that meeting foreign people and exchanging our good Japanese culture and thinking with theirs became one of my missions, and it also increases my quality of life, possibilities toward the future. Thank you Bent, Lars and all for visiting Japan and Change Vision. On Monday, I visited Toyota with Craig Larman(author of Applying UML and Patterns -- which is my favorate OO book -- and Agile and Iterative Development), and Bass Vodde(A Certified ScrumMaster who recently led a ScrumMaster Course in Tokyo). In the tour, we walked through Tsutsumi plant and saw mixed-model production lines, Kanban, Andon, Poka-yoke, and people working there. After the tour that evening, we met with Prof. Kurosawa, who used to work in Toyota as a manager, and had good dinner(and Japanese Sake!). Mary and Tom Poppendieck first revealed in Lean Software Development that software development is different from Manufacturing process but have a lot to learn in the princple level. Now, Craig and Bas are preparing a new book, using the concept, exploring it further, and suggesting priciples of scaling agile product development -- "Scaling Lean & Agile Development: Successful Large, Multisite & Offshore Products"
I expect it to be another big step for the Agile movement. 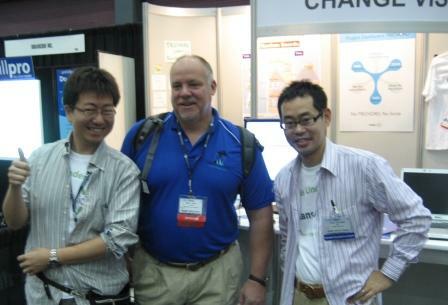 Change Vision, Inc., exhibited TRICHORD, an Agile project management tool with Kanban(ticket system implementing pull production control in Toyota factories) at SD Best Practices 2007, in Boston. * Jonathan Erickson, Editor-in-Chief of DDJ, had an interview with me, and published TRICHORD white paper at Dr.Dobb's Portal the next day! He was very nice and friendly, I enjoyed very much the conversation we had in the press room. * I had a chance to talk over the phone with David Rubinstein, Editor-in-Chief of SD Times, about our new idea of TRICHORD Kanban system. I hope it will be published somewhere, soon. Thank you, David Lyman for this arrangement! David writes "Industry Watch" in SD Times, and was interested in Lean Production/Thinking adapted to Software Development. * Mike Cohn, the author of the most important book for us "Agile Planning and Estimating" dropped in at our booth, and talked a while with us. Our TRICHORD development team have leared a lot from the book. Thank you, Mike! * Jean Tabaka, the author of the most lovable agile-facilitation marriage book "Collaboration Explained: Facilitation Skills for Software Project Leaders", also played around with TRICHORD and liked Niko-Niko Calendar and our T-shirts. Thank you, Jean! She always gives me huge courage. * Michael Vizdos, co-author of "The Enterprise Unified Process" and now a passionate Scrum master, found the "Cards on a wall" and talked to me. Yes, TRICHORD is "Cards on a wall". I'm very glad you came by, Michael! And lots of lots of people visisted our booth, thank you very much! If you are interested in our Team-Centered Agile Project Management Tool, implementing Kanban method, please visit TRICHORD site. A quick installale free version is available.